Many of us Asians are mostly not blessed with defined facial features unlike the westerners. But thankfully there’s always cosmetics to achieve the looks that we desire, especially those contoured looks. 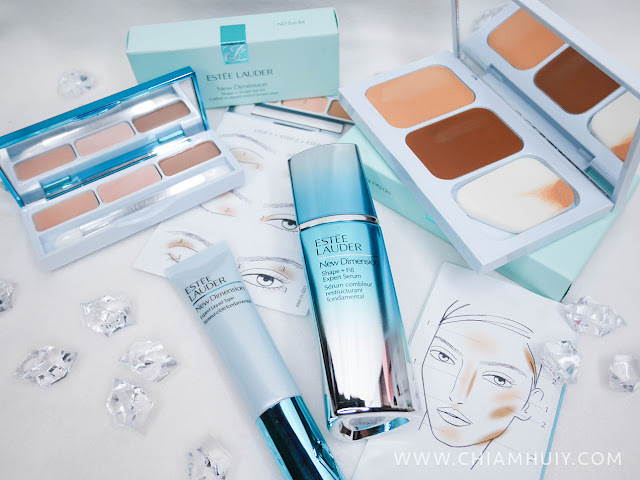 ESTÉE LAUDER’s New Dimension Transformative Collection introduces four different products, consisting two skincare and two makeup items. Let's check out the new items and their performance! First we look at the two skincare product from this collection. The ESTÉE LAUDER New Dimension Shape + Fill Expert Serum ($225.50ml, $153/30ml) is well-known for its breakthrough achievement and multi-dimensional approach. It works on our skin through three approaches - Dimension, density and definition. The transformative shaping technology helps to increase volume (suppleness) on the skin; the pro-collagen complex restores visible density to the skin and supports skin’s natural support structure; and finally the concentrated serum’s formula strengthens the skin’s “inner structure, giving a fuller defined contoured look. I like the fact that this serum has a “uplifting and energizing” scent, thanks to some of the ingredients including Mandarin, Melon, Rose and Jasmine. 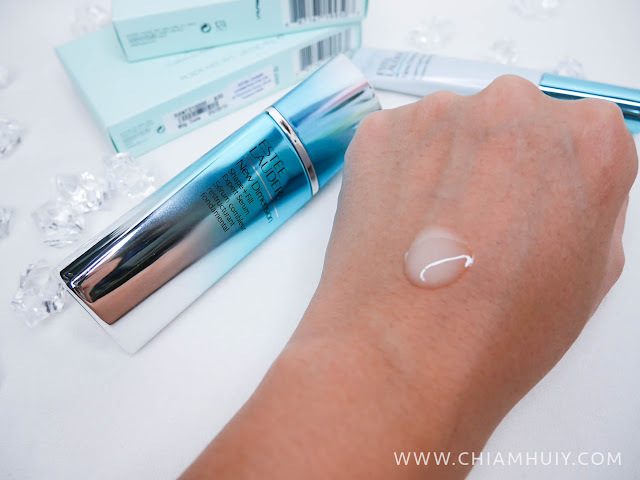 This serum feels light on my skin, and helps maintain my skin’s suppleness. Anti-aging efforts are never too early so I’m taking this ESTÉE LAUDER New Dimension Shape + Fill Expert Serum as an anti-aging product to prevent skin aging issues. So far, the serum has been doing well and I face no breakouts or any negative effects. Another important product to give you the sculpted look is ESTÉE LAUDER New Dimension Expert Liquid Tape ($110). The reason why it’s called a liquid tape is because of the way it’s supposed to be applied. There's a twist knob for you to control the amount of liquid tape to dispense out. 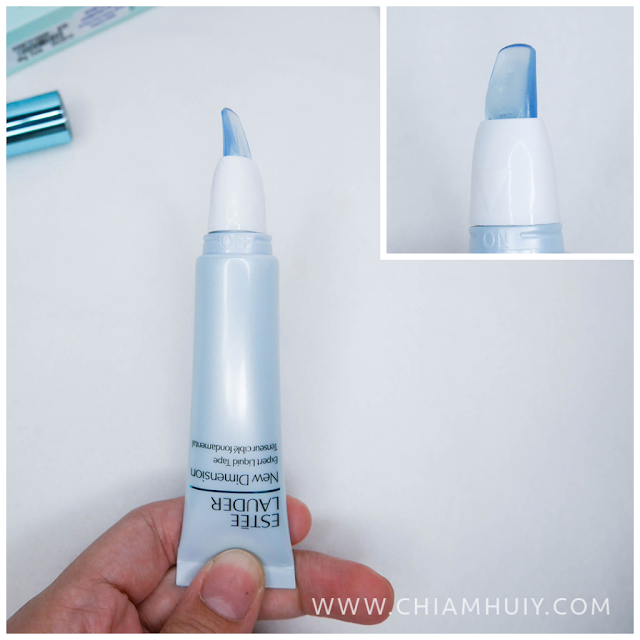 This liquid tape is meant to produce an instant tightening effect, for example on areas like laugh lines, upper cheekbones, up to temples and overall eye area. It contains concentrated HA boosters and pro-collagen complex to give you a firmer sculpted look. 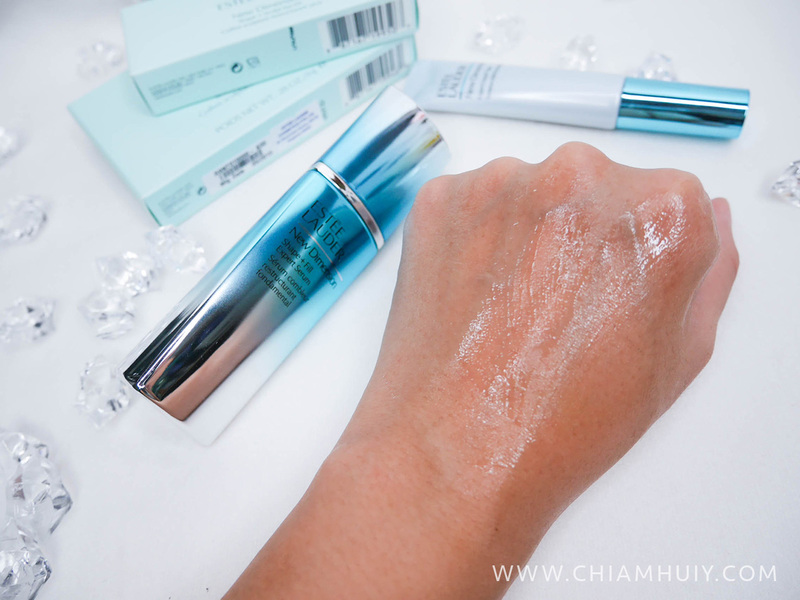 ESTÉE LAUDER New Dimension Expert Liquid Tape gives a slight tingling and heating sensation when applied on my skin. Don’t worry, nothing bad’s going on, it’s just the tightening effect that is going on. The liquid tape would work better on matured skin because of the amount of collagen and skin suppleness women lose over the years. Hence this product would produce more obvious and significant results on middle-aged women onwards. 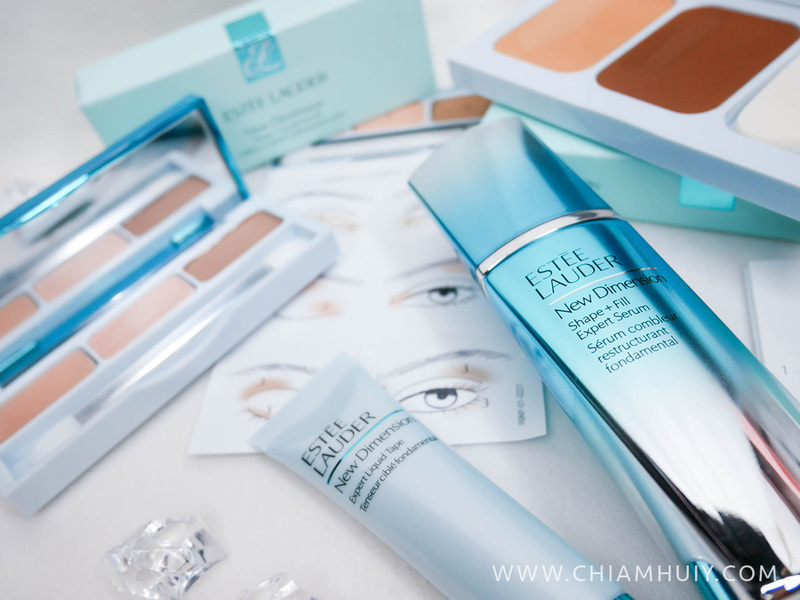 Moving on to the cosmetics are ESTÉE LAUDER New Dimension Shape + Sculpt Face Kit and Sculpt Eye Kit. Because serum takes a while to see results, you can rely on cosmetics to achieve instant contoured look. 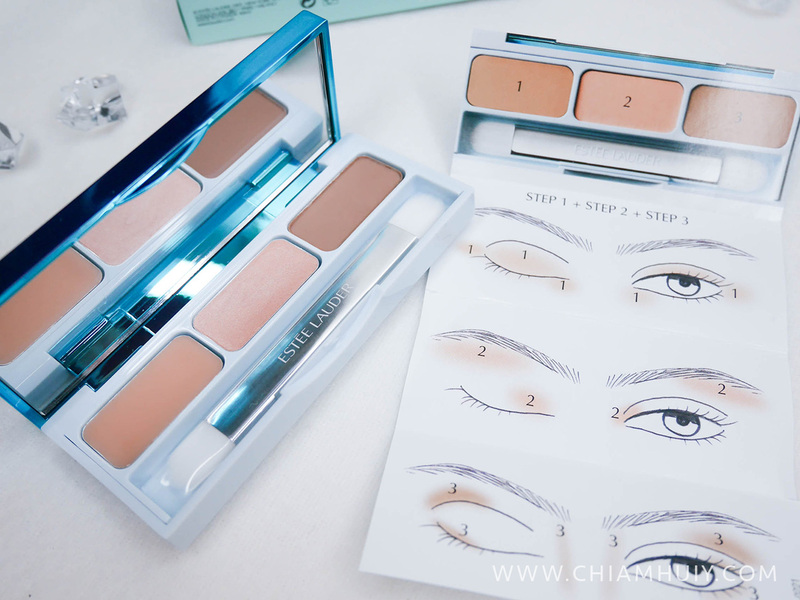 This Sculpt Face Kit ($68) comes with the two usual colours - a highlighting colour and a contouring colour. 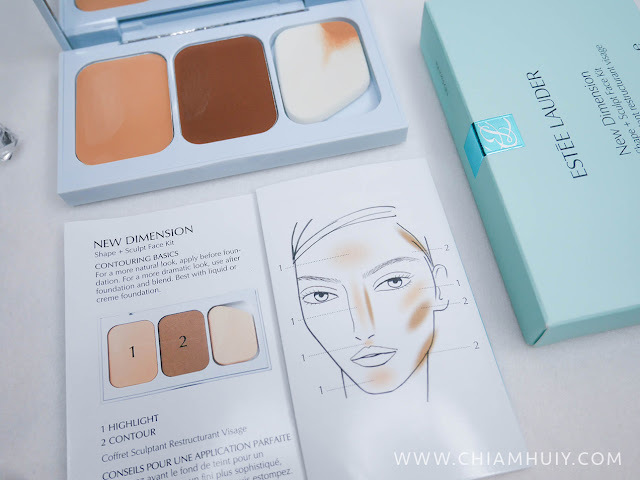 Each Sculpt Face Kit also comes with instructions guide on how to contour your face. 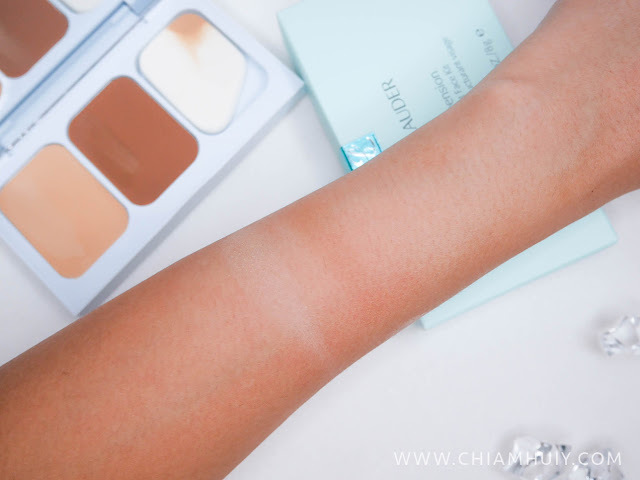 You’ll be surprised that this contouring colours are actually cream-based! I usually see contouring makeup items to be in powdered form, so this was quite a surprise and fun for me to experience. 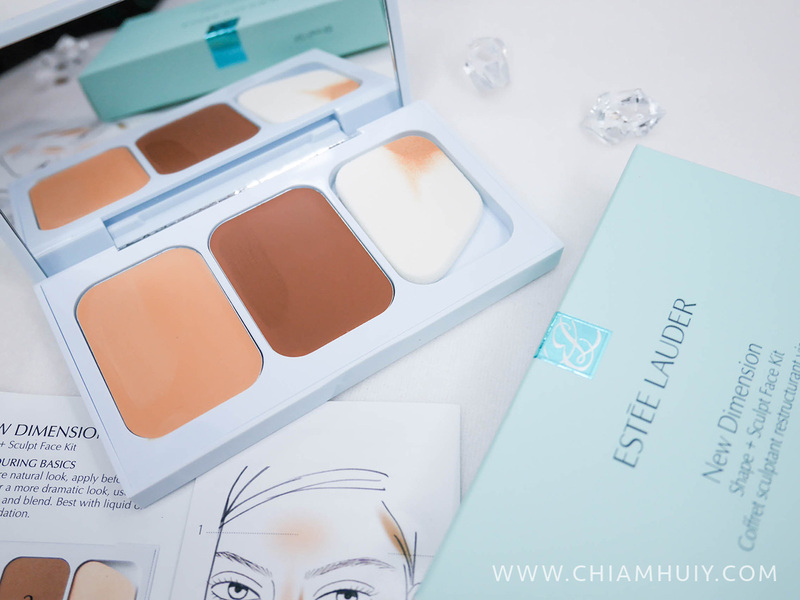 On the other hand, ESTÉE LAUDER New Dimension Shape Sculpt Eye Kit ($60) comes in both cream based and powdered base.There three shades in the palette - Smoothing base, Contour Shade and Highlighter Cream. 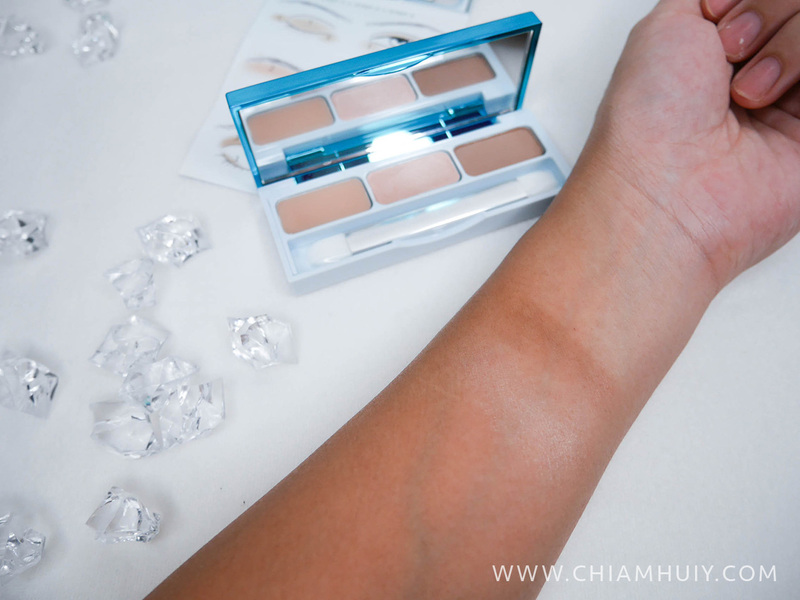 The contour shade here is the only powdered shade. The Smoothing Base helps to prep the eyelid, the Contour Shade defines the eye while the Highlighter Cream accentuate the eye look. I always appreciate a inbuilt mirror and brush provided so that I can use it on-the-go!